Talking Thermometer Ideal For Visual Impaired Users. You’ll know that on those occasions where you need to check your or your loved ones’ temperature, it can be potentially a stressful time. This talking thermometer injects a little fun when taking temperature. Kids will love it as a human voice lets them know exactly what their temperature is, and the visually impaired will no longer need assistance in this situation. 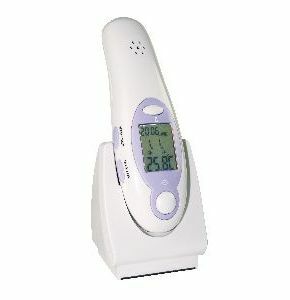 It can be used to take temperature from the ear and forehead, and has a large, clear LCD screen that displays the result. Taking just two seconds to accurately measure the temperature, it is accurate to a fifth of a degree (°C). seconds and is clinically accurate to +/- 0.2°C or +/- 0.4°F. This device also has a working clock and calendar display, and requires two AAA size batteries (not included). Really easy to set up and use, very accurate with either forehead plastic cover fitted or with the plastic forehead push on peace removed for in ear use gives the exact reading and the stored data actually shows you if the reading is from inside the ear or from the centre of your forehead, it as a blue backlit display as well as speaking the tempreture and if you hold the backlit button display in for a few seconds then it lights a small LED light on the back as a small search light so if your searching for a dropped item at the side of the wife in the middle of the night then your life\'s not at risk by waking her up, ha ha, joking aside a very useful and accurate item, highly recommend, and a 5* service as always from Active Mobility Centre.